Linanthus orcuttii (Parry & A. Gray) Jeps. Habit: Annual. Stem: 5--10 cm, sparsely puberulent. Leaf: lobes 5--12 mm, linear, hairy. Inflorescence: cluster or flower 1; flower sessile. Flower: calyx 6--10 mm, membrane as wide as lobes; corolla funnel-shaped, tube 5--15 mm, stout, white grading to purple (on any given tube), throat 3--5 mm, white or yellow, lobes 5--8 mm, generally pink, with 2 purple marks at base, 1 at each sinus; stamens included or at mouth. Fruit: < calyx, obovoid. Seed: 15--30, not gelatinous when wet. Ecology: Chaparral, pine forest, desert scrub; Elevation: 1100--2150 m. Bioregional Distribution: PR, D; Distribution Outside California: Baja California. Flowering Time: Apr--Jun Note: Plants from SnBr assigned here in TJM2 now treated as Linanthus bernardinus. Citation for this treatment: Robert Patterson & J. 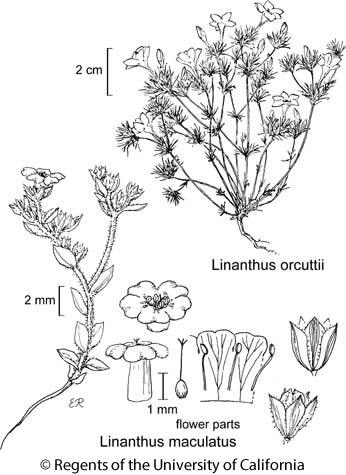 Mark Porter 2015, Linanthus orcuttii, in Jepson Flora Project (eds.) Jepson eFlora, Revision 3, http://ucjeps.berkeley.edu/eflora/eflora_display.php?tid=31067, accessed on April 19, 2019.